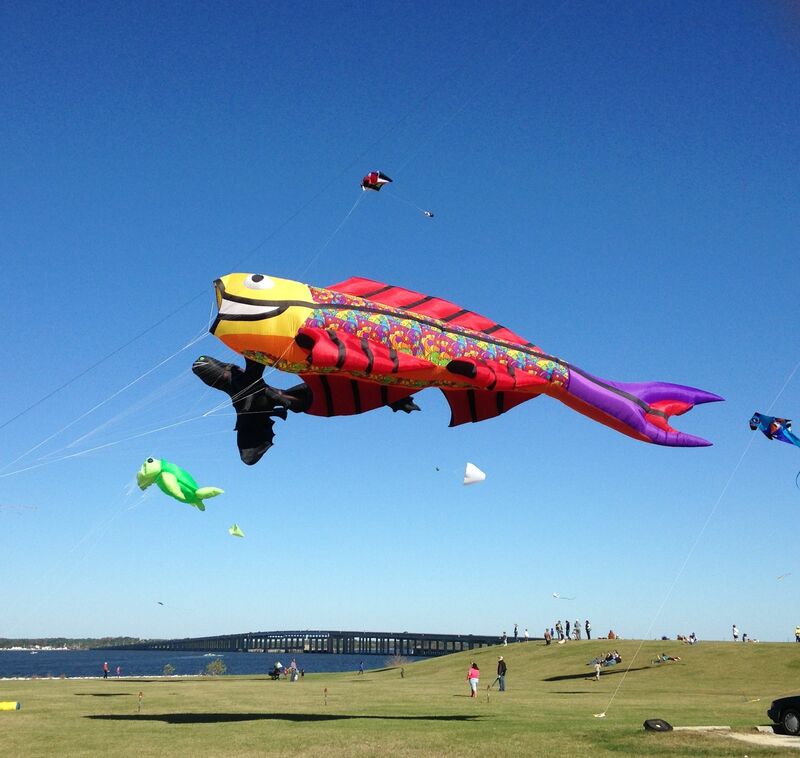 The Sailwinds Kite Festival is held every October in Cambridge Maryland. The park is alongside the Choptank River within sight of Route 50. It isn’t a very large area to hold a festival, but the fields are big enough to launch some show kites, and the community turns out to support the event. With children’s kite building, face painting and other activities, this event brings out the children to enjoy flying kites. It means there won’t be a lot of room to fly maneuverable kites, but this is a family event, and everybody shares the sky. This year the wind was fairly strong. For me, that’s bad news, because I specialize in fighter kites, and fighter kites like lighter breezes. 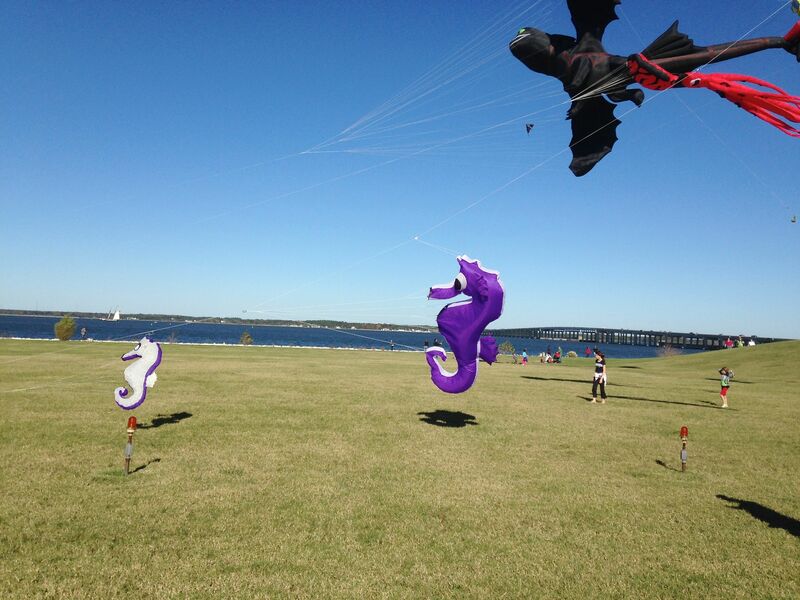 I had a couple of kites that would be at the edge of being effective in a high wind, so I was hopeful that I could join in the fun. In any case, it was great to watch my fellow flyers at Wings Over Washington fly their show kites. 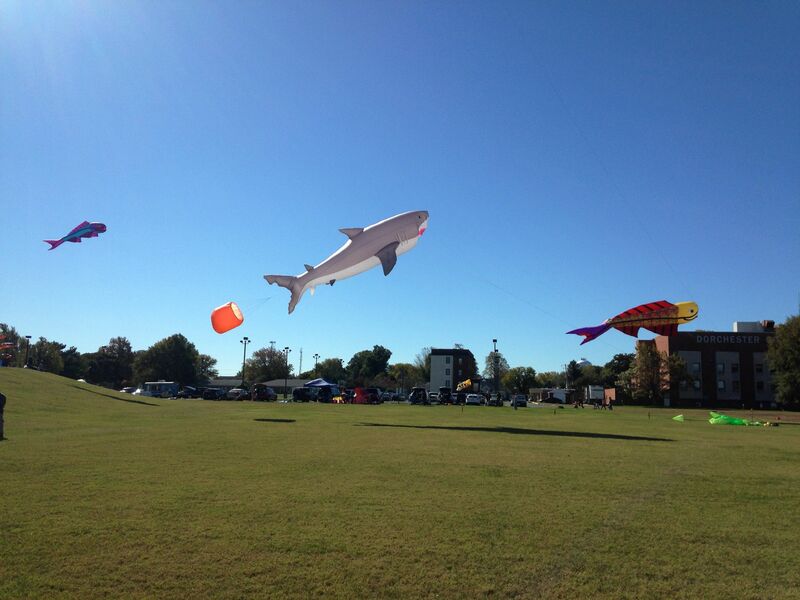 As for me, I managed to fly a couple of my kites. It wasn’t easy in the high winds, but I enjoyed myself, and I enjoyed watching the children and their parents flying kites on a beautiful fall day. 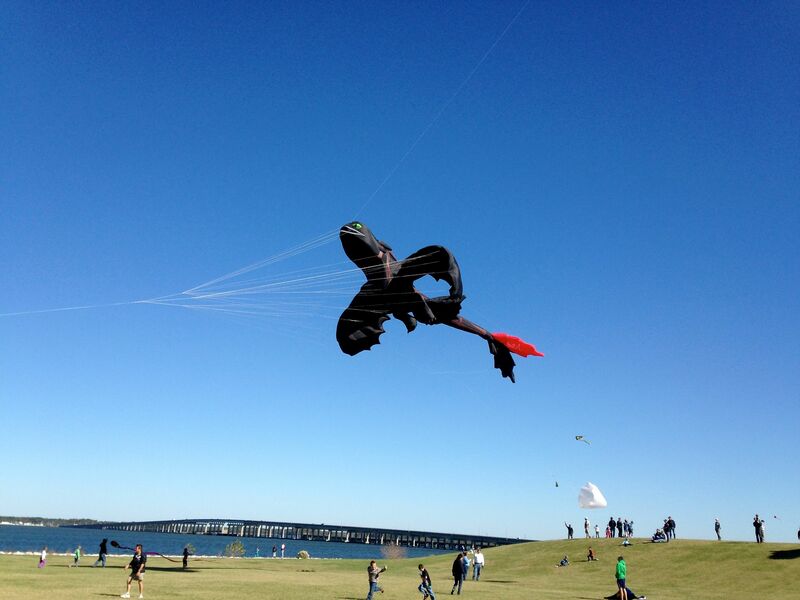 It’s tough not to enjoy a kite festival. They’re very positive events. Toothless the dragon rises over Cambridge. The Shark delighted the crowds. 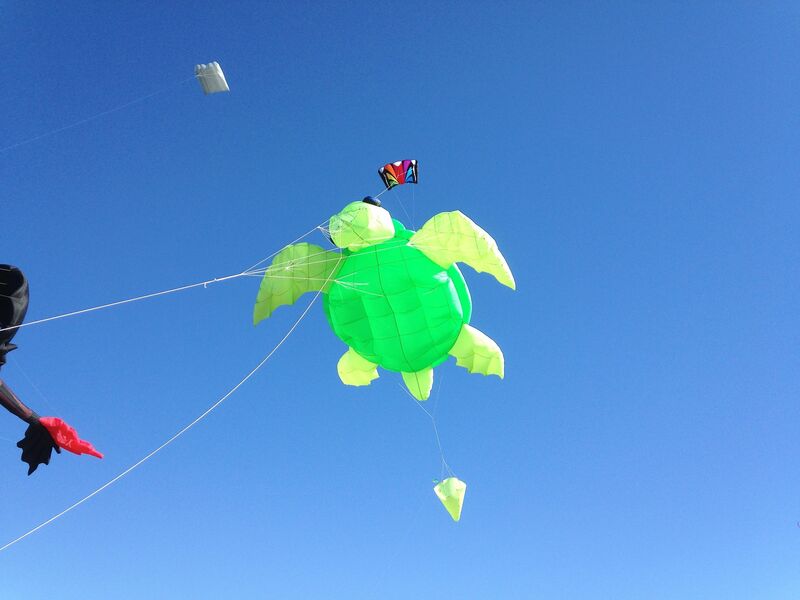 This Sea Turtle took flight in the afternoon. This colorful Carp flew well all day. These Seahorses joined he other aerial sea creatures. 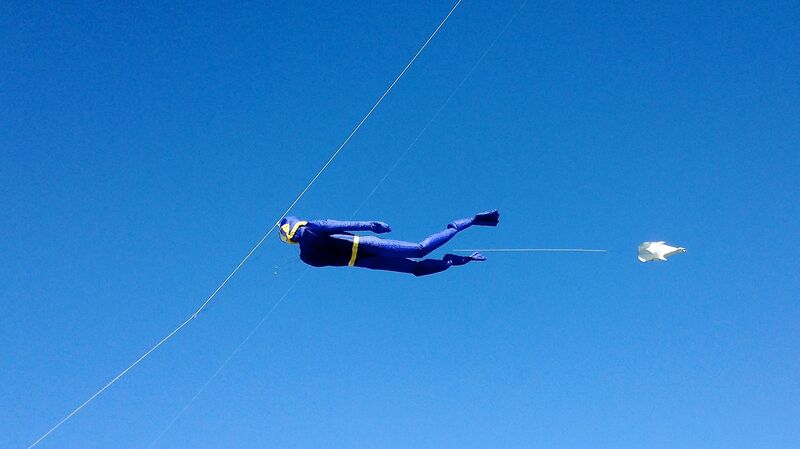 A diver completes the theme. This entry was posted in Front Page on October 28, 2014 by kitefencer.